Volkswagen is marking 40 years of the Golf GTI with a limited ClubSport Edition. The 290PS hothatch will cover 0-62mph in 6.3 seconds and cost from £30,875 when it arrives in showrooms in the summer. The original Golf GTI was launched in 1976 and was powered by a 1.6-litre petrol engine with 110PS. The seventh-generation GTI gets a considerable power hike over the original, with its 2.0-litre turbocharged powertrain delivering 265PS to the front-wheels while an overboost function in third gear or higher will increase power to 190PS. The Golf GTI ClubSport Edition 40 will be limited to just 1000 cars and be capable of reaching an electronically limited top speed of 155mph. The 0-62mph sprint will take just 6.3 seconds - 0.2 seconds quicker than the standard Golf GTI - and peak torque will be the same as the standard car, at 350Nm. The Golf GTI ClubSport is available as a six-speed manual or DSG automatic and the latter will add £1415 to the list price. Three-door versions will be available from £30,875 and five-door versions will cost £31,530. 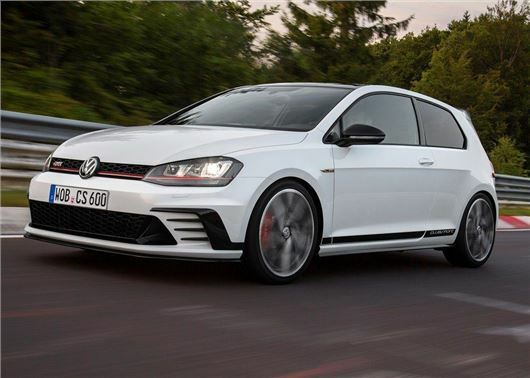 As the pictures show, the ClubSport gets a number of styling additions over the standard £27,435 GTI, with “Quaranta” forged 18-inch alloy wheels that are nearly 3kg lighter per wheel than the standard alloys. There are also new bumpers, new side sills and rear diffuser. The bumpers feature enlarged black air deflectors and honeycomb air intakes. Inside the ClubSport gets bucket seats, Edition 40 badges and leather trimmed steering wheel and gear knob and red seatbelts.